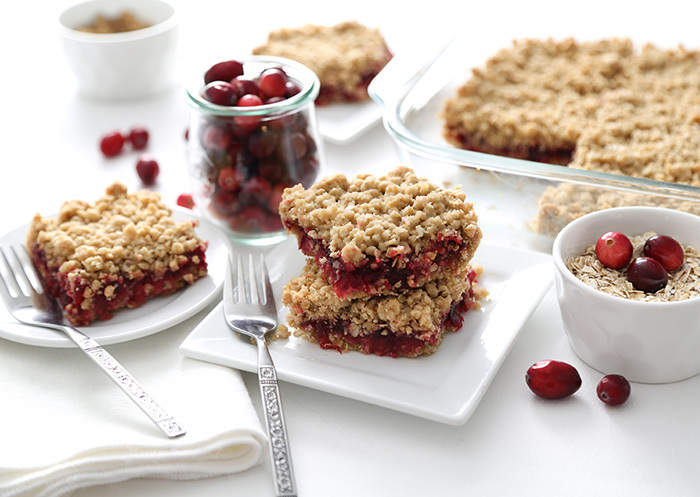 There's something so wonderful about the flavor of tart cranberry in winter months. 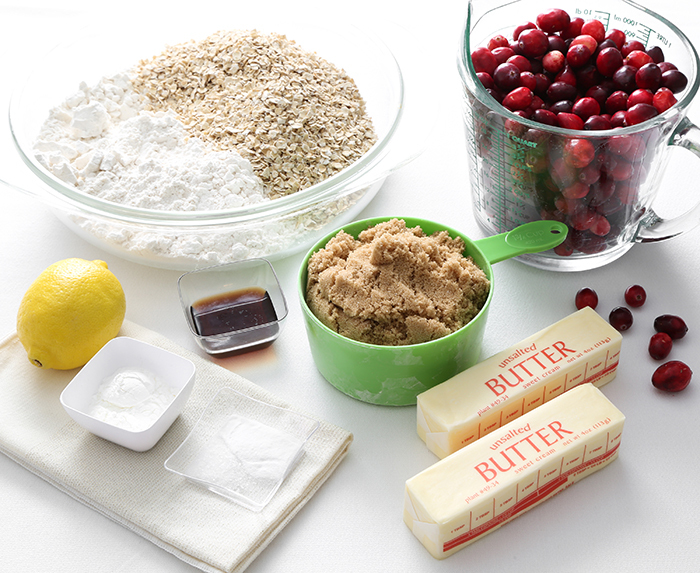 Is it coincidence that the berries are harvested just in time for holiday baking? I think not! Mother Nature gives us just what we need to wake up sleepy winter taste buds. 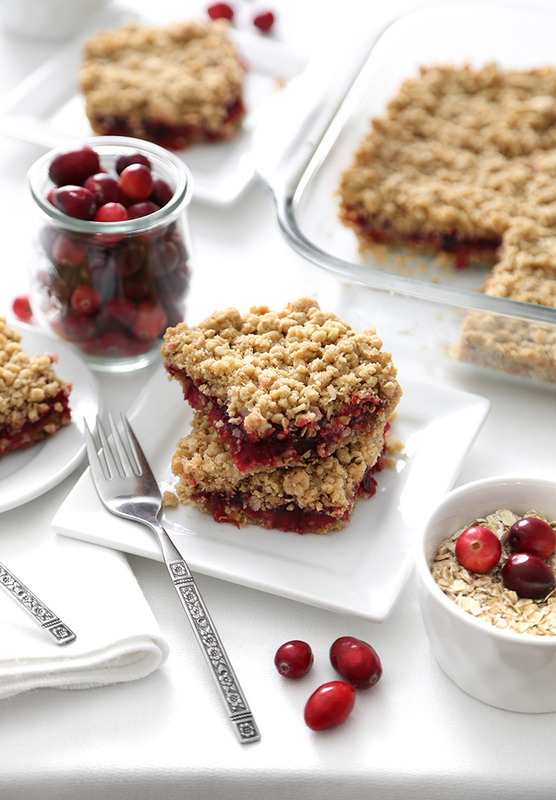 These bars hold a tart layer of jammy cranberry between two layers of vanilla-scented oat crust. They would be right at home on any holiday cookie tray, but I often found myself craving them for breakfast with coffee (oats = breakfast, right?). These come together quickly because the ingredients are so simple. 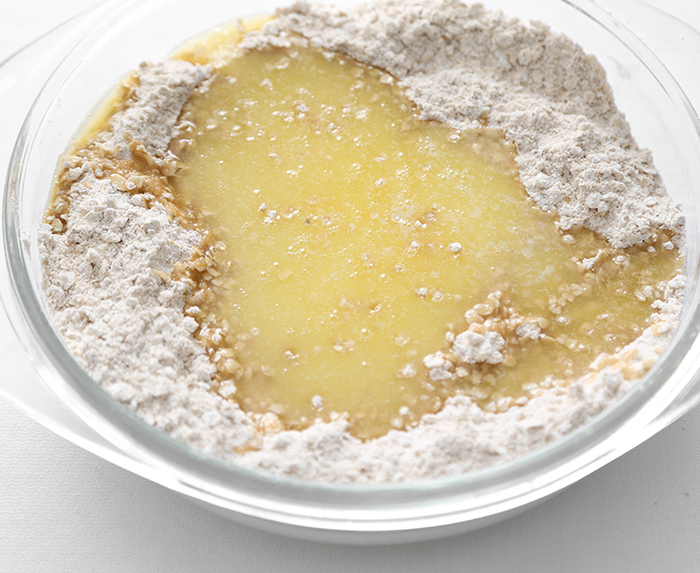 Chances are you have all the ingredients for the crust in your pantry. The crust is held together with a whole cup (!) of melted butter. 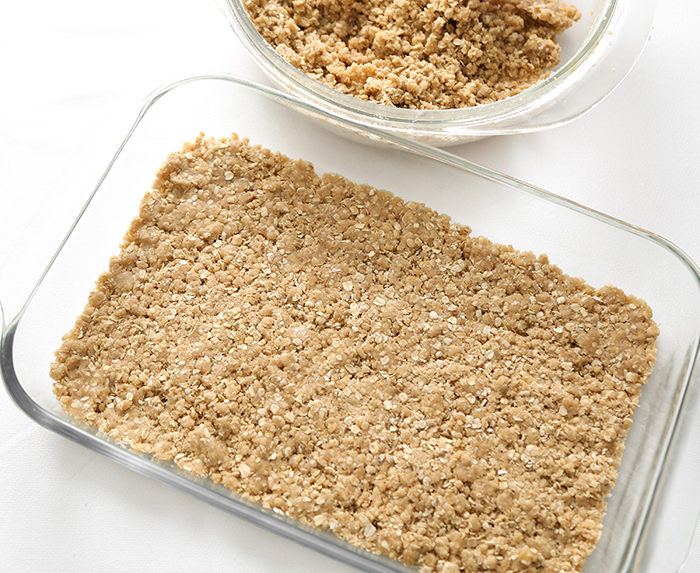 Brown sugar makes the crust packable. Above you can see half of the oat mixture pressed into the bottom of a 13x9 dish. Cranberries are cooked down with sugar to a jam-like consistency. Be sure to cover the pan as you cook them! When they pop a little bit of hot berry juice will burst forth and could cause burns. Just look at that red color! The jam is so pretty absolutely brimming with tart flavor. After the berries are spread over the crust, the remaining oat mixture is sprinkled on top. Despite the 'crumble' in the recipe title, the bars slice rather cleanly. Large square bars make a hearty breakfst, but I plan to cut smaller pieces for holiday cookie trays. They are a cozy treat and so season appropriate! Combine cranberries, sugar, lemon juice and vanilla in a large sauce pan; cover and cook over medium-high heat until berries pop. 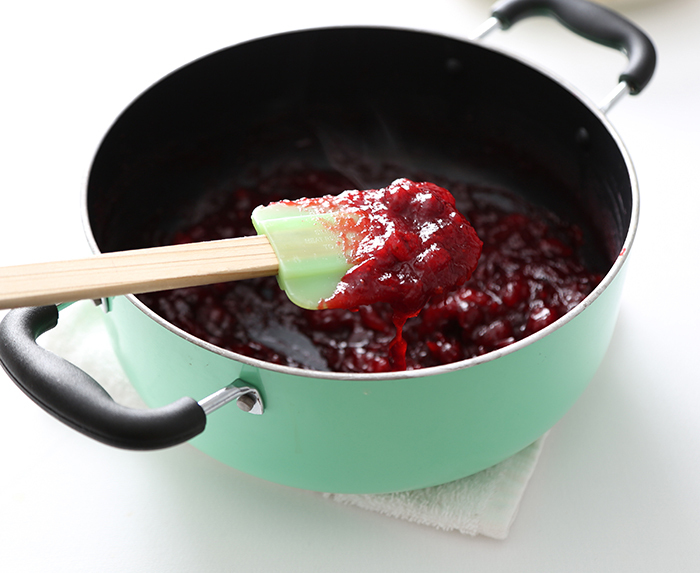 Reduce heat to medium and cook until mixture thickens to a jam-like consistency. I just made this with leftovers from your Cranberry Champagne Sauce recipe! 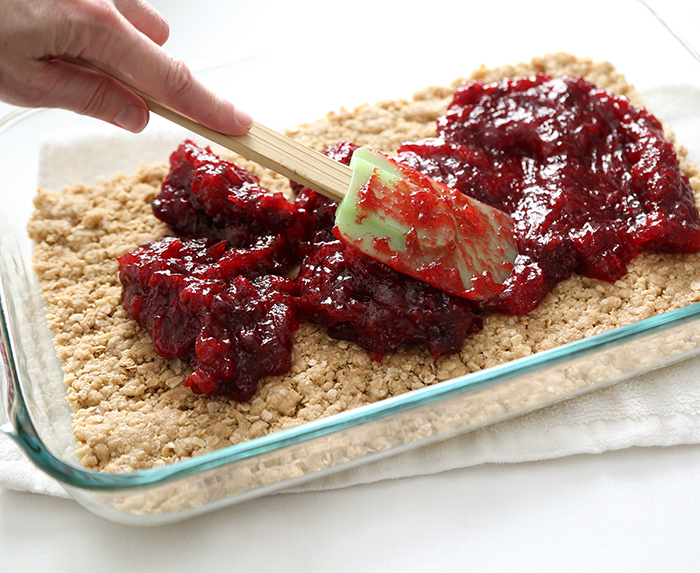 I didn't have a lot of gelatin on hand when I made it for Thanksgiving, so it was more of a relish/jam which was not only delicious for the meal, but it just made a delicious cranberry stripe in this oatmeal crumble bar! I'm a little worried about having an entire 9 x 13 pan of it because it is too good. Thanks for helping me upcycle my cranberries! That is such a smart idea! I'll have to try that sometime with leftover cranberry sauce! I love cranberries and oats together! These bars look delicious!